I wanted a jack russell for years. I could not get one however, because I had an 18 yo cat. 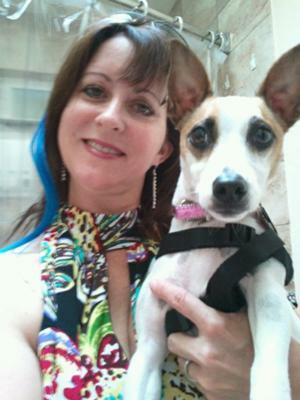 I thought I would foster and called Second Chance Dog Rescue and said I wanted a Jack Russell. They said they had a jrt mix and that he was a cute fellow. I got in my car and got this little pee-stained guy with no name from cage #19. Much to my surprise, Reise was good with my old cat. (I did make sure they were separated when I went to work)and I began to think about adopting him. Reise has been with me for 2 and a half years now. Reise is my best friend and always eager readytogo companion. I even got to meet the famous Victoria Stilwell thru him and had a VIP lunch and special one on one training session with her. I love hearing when Jacks and cats get along - since the combination of the two gets such bad press. I love cats but knowing that they usually don't get along with cats has kept me from getting one. And I'm so jealous that you got to meet Victoria Stillwell. I love her show and sometimes wish she would find her way to my house to work with my Jack Buddy! !